If you’re planning on project managing your house redesign, renovation or extension, there are health and safety guidelines you must follow to ensure that your building site is safe for both yourself and the trades people operating there. Our guide is here to make sure you're aware of your responsibilities before starting a home renovation, so they don't come as a shock when the project begins. The Construction (Design and Management) Regulations 2015 (CDM) is a legal requirement to improve health and safety where construction is taking place and provides guidance on what you should do to ensure site safety from concept to completion. Once only applicable to commercial projects, it now applies to all residential renovations too. 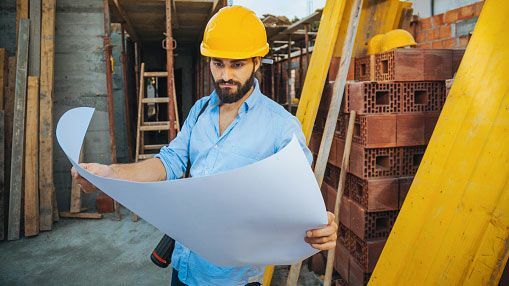 Whether you’re managing small or large-scale building work – this includes everything from adding an extension to a whole house remodel or loft conversion – if you’re acting as project manager, you have to ensure the construction site is safe so that no one is harmed during the work, the building is safe to use and maintain and the project gives you good value. The key to successful CDM adherence is good planning, according to the Health and Safety Executive, which states in its guidelines that effective planning will help ensure that work is well managed with fewer unexpected costs and problems. What do I need to do as a project manager? As project manager your role is varied and includes organising the day-to-day activities on site, taking deliveries, ordering materials, and liaising with your hired trades to ensure the project is running to schedule. Have a read of our guide to project management for a better idea of exactly what the role entails. In terms of CDM, you’ll be acting as the ‘principal contractor’, so you should understand all the potential risks on site and know how to manage them. As well as actively supervising the work, you’ll need to keep health and safety in mind when making all decisions, as each could have an impact on the welfare of workers and those affected by the work. The greatest causes of accidents on site are falls from height, collapse of excavations or structures, exposure to building dust and asbestos, carelessness around electricity and lack of protection to ensure nothing from the site damages members of the public, you or others working there. You should always allow adequate time for all tasks to be carried out properly, ensuring this time is built into plans in the early stages, plus keep communications open with your designer and contractors at all times, to help them plan their areas of responsibility effectively and alert you to new risks. Additionally, you’ll need to ensure there are adequate facilities on site, such as a portable toilet and somewhere to take a break. You must draw up a plan to show you’ve assessed the health and safety risks (also known as a Construction Phase Plan, search your app store for the CDM Wizard app for help on compiling your plan) and have a system in place for managing the risks identified (work should not start on site until this plan is completed), plus keep a health and safety file throughout the build process, which is a record of all risks encountered to help you manage future repairs, maintenance or further construction. Finally, think about the practicalities of accessing the site during the work, and also getting to the main house if you’re project will only impact part of the property. You’ll need to discuss with your contractors if pedestrian access may need to be rerouted or change the way vehicles enter the area. It is worth noting that if you are carrying out work to your home on a purely DIY basis, CDM regulations do not apply. What should I do to manage the risk of accidents? Falls from height: ensure ladders are in good condition, tied and footed and used at a 1:4 angle; use guardrails, midrails and toeboards on roofs, gable ends and platforms, cover fragile roof surfaces and secure working platforms. Collapse of excavations: cover or barrier all holes. Collapse of structures: support walls, beams chimney breasts and roofs with props. Exposure to dust: use tools with wet cutting and vacuum extraction and use a vacuum cleaner rather than sweeping up dust to stop it spreading. Exposure to asbestos: do not start work if you suspect asbestos; organise a demolition/refurbishment survey before continuing with the project. Electricity: turn off the supply before drilling into walls; do not use power tools near suspected buried services. Lack of site protection: secure the site; net scaffolds, signpost the site to pedestrians and use rubbish chutes. What happens if I don't follow CDM? If you don’t follow the guidelines under CDM, you risk the safety of you and the trades on site, plus open yourself up to additional costs to the project due to poor planning and risk assessment. Failure to comply could also result in sub-standard finishes to the completed design, which could in turn affect the value for money of the property. Serious breaches of health and safety, including accidents on site, could lead to work being stopped by the Health and Safety Executive, which will incur a Fee for Intervention, which applies when an inspector finds a serious fault that they need to report, or prosecution. For more information on your responsibilities under CDM, visit hse.gov.uk. Download CDM Wizard to help plan your construction phases effectively.